WHY? 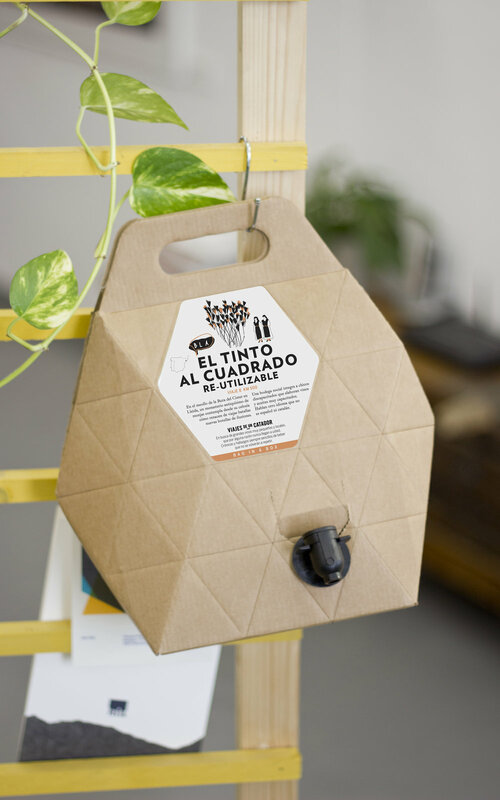 Our agency designed a bag-in-box for Viajes de un Catador (Travels of a Wine-Taster), a wine club that gathers together intriguing wines from all over Spain. The club features eight different wines: Wine of the Year; Unconventional Wine; Classic White and Classic Red; Modern White and Modern Red; a sparkling wine; and the bag-in-box wine. In the case of the bag-in-box, we played off the idea of a wine that –in the words of its producers– is straightforward and friendly, drinkable, versatile, and robust. A wine with values, ideal for tapas or an al fresco party. A red to have fun with, to smell and to drink. What? Taking inspiration from this festive spirit and the fact that its bag-in-box sales format makes it ideal for informal events, we decided to emphasize the wine’s playful aspect, its portability, and its presentation to come up with the most functional and innovative packaging possible. HOW? We also presented the possibility of a second use, including instructions in the package so that the cardboard container could be used as a construction toy with hexagonal pieces. They wanted packaging that was well-rounded. It needed to stand out from the crowd without neglecting functionality, and the design team also wanted it to be environmentally-friendly, avoiding the use of plastic bags and lengthening the useful life of the cardboard packaging as much as possible. Choosing this wine also translates to support for a winery that works with the intellectually disabled, relying on these professionals to take care of the shipping and handling at its warehouse. As such, this a socially responsible product. Viajes de Un Catador makes it clear that it wants to support these types of workers whenever possible, as well as other projects to combat social exclusion, or help people and winemakers revive vineyards in challenging regions.